My nephew is incarcerated. It does not have an impact on my daily routine. However I do think about him daily. I would visit him, but its too far away. What happens to the wives and kids? Incarceration destroys families- this makes me angry. Disproportionate % of African American and Latino parents= racist system. This makes me upset and motivates me to want to learn more and organize for change. My adopted daughter is incarcerated. I carry a core grief. Knowing she’s in a system thats as she said “is only adding to her already full bag of pain” She needs counseling, anger management courses. a job, and affordable place to live. Visiting takes half a day, I visit weekly. I take time to write letters, deal with legal support, mail books, and contact other family members. I visit because I love my girl. If I didn’t come, no one would. She needs support and guidance. I need to hear and see how she’s doing. These facts make me feel hopeless and defeated. My husband is incarcerated, and as a child/teen my own father. My daily routine is affected greatly, as we have 4 children, two of which are 2 years old. Its very hard taking care of a household by myself. I rely on my husband financially and physically to help me with these children. My Children miss their father and I take my children to see him. Its very difficult because they do not understand why we have to leave after and hour and why we can’t visit every day. My daughter is incarcerated. Its mostly impacted me mentally. I wonder how she is doing, and I sometimes worry about her future. I visit, because my daughter needs to know that I love her unconditionally. I do not agree with her actions but I will always love her. My soon to be baby mother of twins is incarcerated. Its mentally affected me. I visit to have her mind at ease. My friend and mother are incarcerated. Im always preparing for visits! sending letters! I work more hours for the money & gas. I always visit. I would also donate my time as a yoga teacher. My sons, now grown have been adversely affected by displaced memories chronicled by prison photos with their dad. How sad a lasting memory. Unfortunately, my youngest son followed suit of his step-father. I dont believe in a generational curse. No positive role models to set an example in his/their life. Post tense, my paramour od 26 years is deceased now. But the impact still lingers for me and my sons. Nothing makes up for the absence. We wrapped up installation on the 23rd of May. Just over a month and a half’s time. Its hard to believe its all over, but the project site lives on at http://www.familyinterruptedproject.com. There will be a couple major updates and additions to the site right off the bat, along with any major project news, and the announcement of the dedication set for early fall. We have a number of mailboxes still in place, and we are relying on the good graces of the host sites to keep them for as long as they are willing. 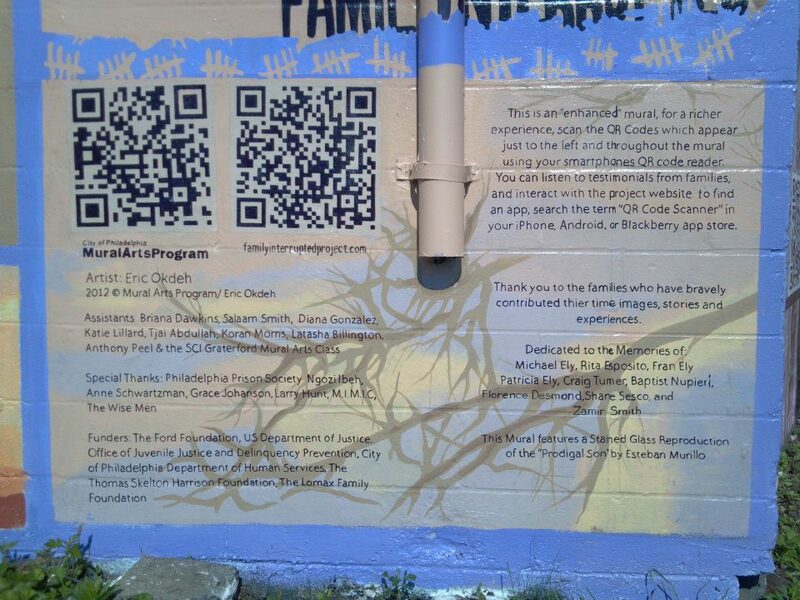 The largest QR code on the mural leads you to the “Share your Story” part of the site. Im excited to see the contributions it yields. A colossal amount of thanks to my assistants Briana Dawkins, Salaam Smith, Diana Gonzalez, Katie Lillard, Tjai, Abdullah, Koran Morris, Anthony Peel, Latasha Billington, and the men of my mural class at SCI Graterford. Additionally, a huge thank you to all of the volunteers, and families, that reached out, sharing their stories, pictures, writing, and time. Many people opened their homes to me, brought their children to our peer groups, and welcomed additional interviews and meetings. Im forever humbled by their strength and willingness to be heard. Its been a busy spring. Ive been hard at work installing and finishing Family Interrupted, while working on a large private commission, and co-designing my summer project for Mural Arts titled “How We Fish” alongside Social Impact Studios . Its been difficult to keep up with my regular updates, so here is a slideshow of images ranging from the wrap-up in the studio, to the installation of the cloth panels. My sister is incarcerated. Now I have a niece to care for and I have to also handle another household, along with fees and attending court. My husband is incarcerated, it has impacted me tremendously. I am a mother of six kids; I am overwhelmed. Now when I need a break I cant take one. I visit him every week. Family is everything to me. Its what gives sustenance and beauty to life. It is the essence of our culture. I am african and that is a statement without explanation. My people have always been people of an extended family. That reality should be perpetuated by us all. Family is beautiful, it is who I be, the reflection of my African diaspora. I write my family. Even if they dont write me back, because regardless, I love them! I call them. Regardless of how much it costs me, because their voices are unparalleled to anything I have heard or felt. I love them. Regardless of whether they love me back, because my tears for them are genuine. I long for them. All of the time. And that reality is what I remember (to do, think, and react to) before I commit the next crime. My greatest suggestion is that people recognize that love will find a way. And the only way for Love to find a way is to leave a door open. Never close the door. Whether you are in home, or in prison, you must always stay focused. In my heart I truly believe that. Stay focused and the future is up to us. I’m scared for my son and any future children I may have. I’m also concerned about the young men and fathers to be, for their children. My nephew who is 22 is currently incarcerated for 10 years for assault and attempted murder. Knowing that he is alone in there, I feel bad, and scared for him. I would visit him if I could. (only immediate family is allowed) I want him to know that he isn’t forgotten and that he is still loved. These facts are horrible. The U.S. is leading the world in mass incarcerations and spending virtually northing on diplomacy and peace building. My boyfriend is in prison. I was incarcerated once, I feel scared for him because of all the things that happen in there. I cannot visit him because I am on probation. Incarceration affects more than families, it affects society and the innocent. I feel for anybody who has been a victim. Hopefully rehab can cure a person’s sins. I have 2 sons and a brother in prison currently. My Grandfather and other brother died in prison. Plus another two brothers who spent the majority of their lives in prison. These facts make me feel that my brother, as an inmate, does not have total control of his life incarcerated. Having an incarcerated family member makes me appreciate my freedom and value family, because you never know when you can lose them to jail or death.